Gaurav Prakash, 35, is a senior solution architect working with Ericsson India Ltd, in Gurgaon. But a problem that he can’t find a solution to is his house. Towards the end of 2011, he along with his wife Sashi Pandey, a 35-year-old senior manager in a telecom company, bought an under-construction apartment of about 2,000 sq. ft in Dwarka Expressway, which falls roughly between Gurgaon and Dwarka (on the south-western periphery of New Delhi). The house cost them 70 lakh, for which the couple took a home loan. They were told that they will get possession by around June 2014, but that didn’t happen. And like scores of other urban Indians, they too, are still waiting for the house two years later. But apart from the house being not available, what bothers them, and others alike, is that they are not able to make use of the substantial tax benefits available on a home loan. And then there’s the rent they continue to pay. “We are paying 52,000 as equated monthly instalment (EMI), and 28,000 as rent every month," said Prakash. So, it’s a triple whammy. Here’s why. “Typically, a delay of 1-2 quarters can be expected in almost every project," said Anuj Puri, chairman and country head, JLL India. “However, certain projects that are stuck due to funding or approval related issues get delayed much beyond that. We have observed delays ranging from 12 to 18 months for such projects," added Puri. Data from PropEquity Analytics Pvt. Ltd, a realty research and analysis firm, supports this. The average delay in possession of housing units which were scheduled to be delivered between 2013 and 2015 is of 30 months in the National Capital Region (NCR). This is followed by the Mumbai Metropolitan Region (MMR) with an average delay of 26 months. The average delay in Kolkata is of 24 months and in Pune, Bengaluru, Chennai and Hyderabad, it is 20 months. Project delay not only restrains home buyers from shifting into their own houses, but also has a big impact on the cost of purchase. Here’s a look at how much that impact can be and how it happens. If there is delay in possession, a home buyer usually has to pay the home loan EMI and the rent of the house she is staying in. For Prakash and Pandey, both put together comes to about 80,000 a month. So, bearing in mind that possession of their house is already running behind schedule by two years, their cost of purchase has increased by 6.72 lakh (based on the rent they are paying for two years; 28,000 for 24 months). Even if we take into account the compensation for delay that the developer has promised to pay, which is only about 7.5 per sq. ft per month, they will get 2.7 lakh (15,000 for 18 months). But usually, developers do not pay compensation for the grace period, mostly of 6 months. So, even in a best case scenario (that the project is not delayed further and developer pays the compensation), the couple’s cost has increased by at least 4.02 lakh (6.72 minus 2.7 lakh). 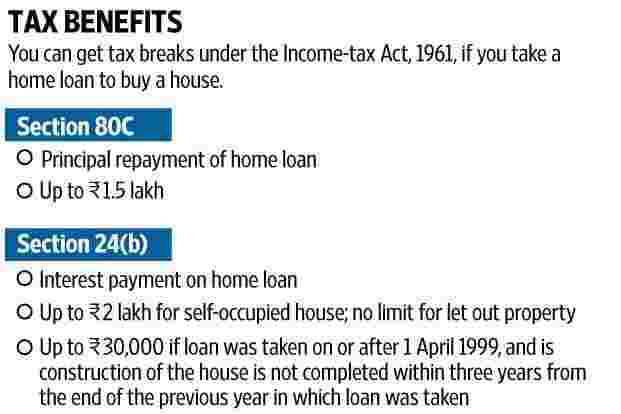 According to the Income-tax Act, 1961, a borrower can claim deduction under section 80C against principal repayment, which has an overall limit of 1.5 lakh, and up to 2 lakh for payment of interest under section 24(b) for a self-acquired house. If it is leased out, then the entire interest paid on home loan can be claimed as deduction. But, “the benefit of claiming principal repayments under section 80C is also tied to ownership. Until the construction of the property is complete and you have the registration and ownership documents, you will not be able to claim for this deduction," said Archit Gupta, founder and chief executive officer, ClearTax.in. So, no possession means no tax benefit on the huge home loan. And that’s not all. Further, “you can claim the entire principal repayment done in a year, under section 80C, in the year in which your ownership is established," added Gupta. Whereas the interest paid during the construction period can be claimed as deduction in five equal instalments, starting from the year of possession. “If construction is not completed within three years, the maximum deduction allowed to a tax payer for interest on home loan is limited to 30,000 per annum," said Gupta. So, for Prakash and Pandey, since the project is still on four years after they took a loan, the tax break they can claim on the interest paid is only 30,000 each, and that too only after they get possession. Had the house been available to them on time, they would have got a tax deduction of 2 lakh, each. The pain continues since there is also income tax to pay on the money that the couple is not able to save based on the tax deductions. If we consider them to be in the highest tax bracket of 30.9%, instead of getting a tax benefit of about 20.21 lakh in 20 years (their loan’s tenor), they will be able to save only about 3.63 lakh. That means a loss of 16.58 lakh. An individual borrower would have saved 11.4 lakh in 20 years, instead of 1.84 lakh, because of project delay. That means a loss of 9.54 lakh. “Service tax has increased from 12.36% to 14.5%. I will have to bear that," said Prakash. In budget 2015-16, service tax rate was increased to 14% from 12.36%, and effective November 2015, Swachh Bharat cess of 0.5% was added to it, making the effective rate 14.5% in total. For an under-construction property, service tax is charged on the cost of construction; cost of land is excluded. For the purpose of calculation, 25% of the gross value of an under-construction unit with value less than 1 crore is considered to be the cost of construction, and service tax is applied on this. So, Prakash and Pandey, if we take the cost of the apartment to be around 70 lakh, they will have to pay service tax on 17.5 lakh. Considering the increase in the applicable rate, they will now have to pay 2.54 lakh (14.5% of 17.5 lakh) instead of 2.16, an increase of 38,000. Then there is inflation. “If getting the interiors done would have cost us 10 lakh, it will now cost 12 lakh," said Prakash. While some of the costs can vary and will depend on a person’s personal choice, the fact remains that the overall cost of service has only gone up. 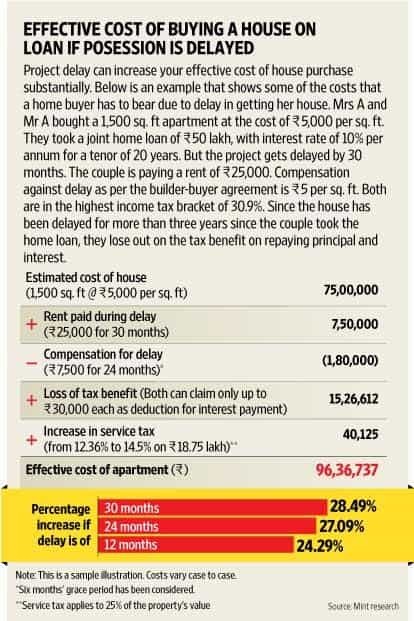 If we take into account all the hikes in expenses and losses that the couple has had to bear, their effective cost of purchasing the house would now be 92.98 lakh. If they had got possession on time, the house would have cost them 70 lakh. This means an increase of about 33% in cost of purchase. So, first try to look at the other options. “Look at the clauses in the agreement for penalties that one can pursue legally," said Anil Rego, chief executive officer and founder, Right Horizons. If for some reason you are unable to service the loan, “one can request the loan issuing bank to allow her to delay the loan payments. But in this case, the interest will get added to the principal and the total loan amount will increase. Moreover, not all banks will provide that facility," said Rego. If the delay is due to the developer, form a home buyers’ association and approach the developer jointly. “The best option is to talk to the developer and try to get the issue resolved as soon as possible," said Rego. Try to convince the developer to enhance the compensation for the delay and complete the construction soon. If the developer does not pay heed to buyers’ demands, you can look for a legal recourse. Under current conditions, project delay is the biggest risk for a home buyer. “ Given the companies’ stretched balance sheets and cashflow problems, we expect execution delays to persist in the short term," said Samir Jasuja, founder and chief executive officer, PropEquity. If possible, avoid buying an under-construction property. It may be better to pay a premium to buy a completed apartment than being in a situation like that of Prakash and Pandey. Also, do proper due diligence about the developer, track record of delivery, quality of projects and financial position, if possible, before buying a property.